The Newbies clearly enjoying this! 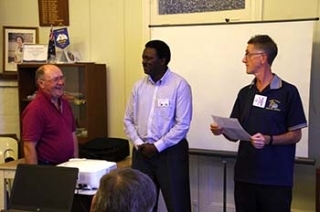 The induction of Bill Fraser and Tom Maina into the Rotary Club of Geraldton Greenough undertaken by Club Membership Director Grant Woodhams. Our ever erudite AM, Mr Grant Woodhams introduced our latest prospective new members, Blli Fraser and Tom Maina to our club, and in invoking the "Rotary Charge" reminded us that we will be judged as Rotarians by the community by our actions. 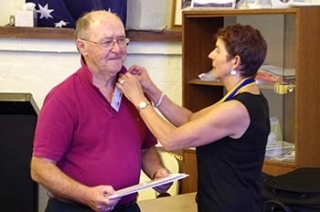 Bill and Tom were welcomed as new members by PP Viki Fennell and they managed to survive the placing of their Rotary pins by Viki with minimal blood spilt!